Rizhao News, 1/19/08 ( Photo Titles ). The Rizhao News published a photo spread using photographs taken for the "Rizhao Eyes of Foreign Photographers Project". The flash epaper version of the spead is online at http://epaper.rznews.cn/rzrb/20080119 (The link to the interactive flash version of the spread is in the right column fourth link from the top starting with an A4). 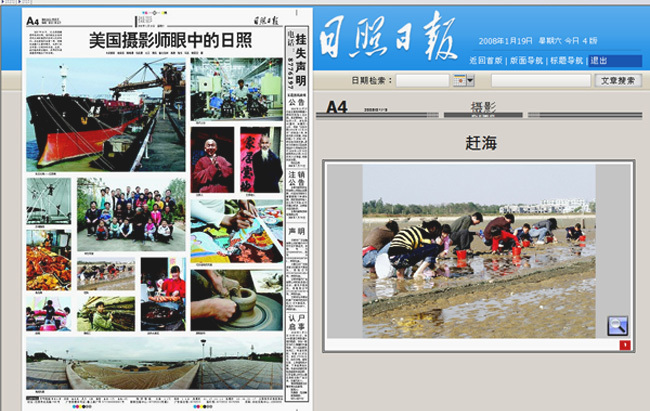 Above is a screen shot of the Rizhao News photo spread. And here is the original caption in Chinese. In October 2007, ten American photographers came to Rizhao and they were deeply impressed by this mysterious land and its industrious people. During their one-week stay in Rizhao, they shot a lot of pictures, capturing the various moments of this oriental city. Here, some of their pictures are selected to show Rizhao---in the eyes of American photographers ( Photo Titles ). their help on this page, as well as the Rizhao News.